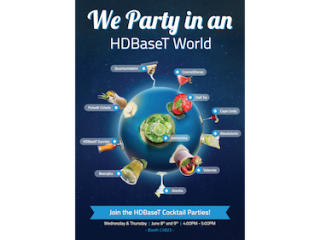 The HDBaseT Alliance has invited all visitors to this year’s InfoComm International to stop by booth C4823 in the Central Hall at the Las Vegas Convention Center to experience the HDBaseT Zone, an area for members, educational sessions, real-world demos, and cocktail parties at the end of the first two days. The HDBaseT Zone at InfoComm 2016 welcomes ten Alliance members, who will be presenting their latest HDBaseT offerings, and providing a one-stop shop for installers and integrators to learn more about the standard for digital connectivity. In addition, the HDBaseT Zone will host the HDBaseT Academy, a series of training sessions and discussion panels carried out by HDBaseT Alliance Experts and member companies on a variety of topics. The sessions are open to all, and require no pre-registration. A full agenda of sessions can be found here. The HDBaseT Academy complements the Alliance’s HDBaseT Installer Expert Program, which has trained thousands of installers and integrators from all over the world. Once again, the program will be presented at this year’s show, and registration is done through the InfoComm’s site. The program entitles attendees to three InfoComm RUs.